Don’t settle for just any socks, give your hard-working feet the best. 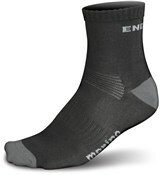 The Endura BaaBaa Merino Socks (twin pack) are constructed from Merino wool, which is itch-free and has a high warmth to weight ratio for comfort in the saddle. The BaaBaa Merino socks are easy-care machine washable for no-fuss cleaning. The durable heel and padded toe area add extra comfort as well as keep the socks in circulation for longer. The naturally odour resistant material is a bonus, especially for friends and family. good comfortable socks but not the most hard-wearing. Nice lighter weight socks for summer, good fit and breath well. Great sock, thin but warm & really good vfm. This maintains that Endura is a quality brand in my eyes. Sound like a cheerleader! whoop! whoop! Excellent value socks. Thin but warm and snug. Recommended purchase. These socks are great value for money. I have them for 4 months, using every day for commute with almost no wear and tear. They dry quickly when wet and don't smell like cotton. They have good padding and are a very comfortable fit. Fantastic socks, comfortable, warm and durable. Everything you could ask for!